The president orders aides to try to identify the author, and issues an extraordinary demand that The New York Times reveal the person's name to the government. 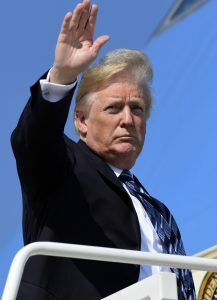 President Trump departs Thursday for a rally in Montana amid White House turmoil over an incendiary opinion piece by a senior government official and efforts to identify the author. They lined up to deny writing an incendiary and anonymous opinion piece published in The New York Times that was purportedly submitted by a senior member of an administration “resistance” movement straining to thwart Trump’s most dangerous impulses. With such a wide circle of potential suspicion, Trump’s men and women felt they had no choice but to speak out. The denials and condemnations came in from far and wide: Secretary of State Mike Pompeo and Secretary of Defense Jim Mattis denied authorship on a visit to India; Interior Secretary Ryan Zinke chimed in from American Samoa. In Washington, the claims of “not me” echoed from Vice President Pence’s office, from Energy Secretary Rick Perry, from Ambassador to Russia Jon Huntsman, from Dan Coats, director of national intelligence, and other Cabinet members. Down Pennsylvania Avenue, House Speaker Paul Ryan said he did not know of any role Congress would have to investigate, although Republican Rep. Mark Meadows of North Carolina, a Trump ally, said the legislative body could take part.